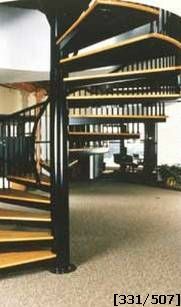 Welded Spiral Stair: The stair pictured here has a diameter of 11' (132"). This is an unusual design since it is designed for two way traffic. The stair was delivered to Kansas City, KS, and the freight elevator was the only available means to lift this spiral stair to the fifth floor where it was installed. This particular stair was designed to be built in four sections. Each section was designed to bolt together and to be field welded for added strength. An inside handrail was used to ensure two way traffic. A spiral stair rail system uses a 1 1/2" round handrail with 1" round balusters and 4" spacing. Our advertising shows our largest spiral stair diameter at 96". Remember the stair shown here has a diameter of 132" - we will always design and build to your specific needs.